Storimbo is a SuperWeb program that can get onto your computer alongside other free programs. The program is promoted at its official websit storimbo.net, which is identical to the website of other SuperWeb programs. At first sight, the Storimbo browser add-on may seem to be useful and reliable; however, the truth is quite the opposite. Storimbo was created to enhance your online experience by displaying third-party advertisements, but those ads may be very obtrusive. The program shows commercial and non-commercial offers on virtually every website you access, and, if this is not want you want, do not wait but remove Storimbo from the computer as soon as you can. Upon installation, Storimbo start monitoring you; i.e. the program records certain information related to your browsing behavior. This behavior is typical of many advertising-supported programs, so, if you install a different browser add-on displaying some ads, it is very likely that it will be monitoring you in the same way as Storimbo. The Storimbo browser add-on record search terms, clicks, impressions, search terms, and other non-personally identifiable information, which can be shared with third parties. Websites to which you are taken by Storimbo may also be using some tracking techniques to monitor you, but bear in mind that you are responsible for your interaction with those websites. In order to reduce the risk of getting the system afflicted by malware and spyware programs, you should implement a reputable malware and spyware removal program. It is possible to uninstall Storimbo, but is essential to provide your operating system with real-time protection against malware and spyware. Our advice is to use SpyHunter. This real-time security program easily removes SuperWeb programs and fights off Trojan horses, fake anti-virus programs, ransomware infections, browser hijackers, and many other harmful programs. If you want to try removing Storimbo by yourself, use the following instructions and scan the computer afterwards. Select Uninstall a program and remove Storimbo. 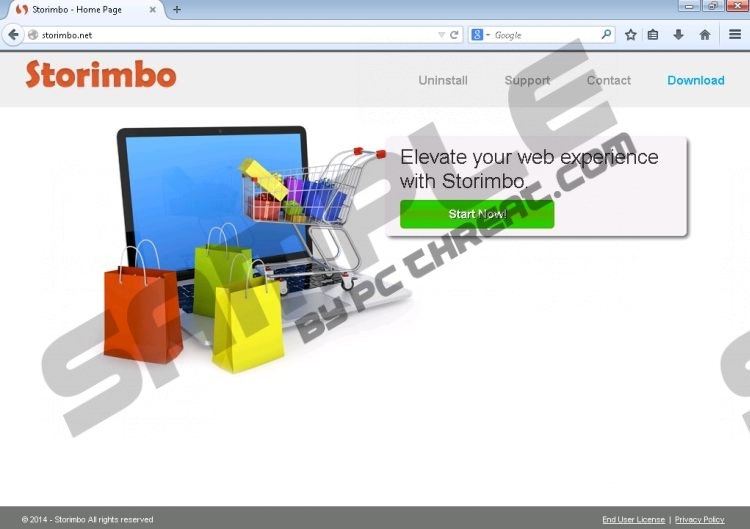 Click Uninstall a program and then remove the Storimbo program. Click on the Add or Remove Programs option. Quick & tested solution for Storimbo removal.